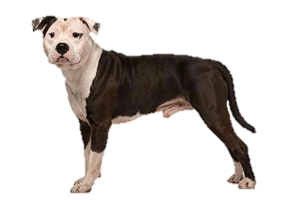 Although taken from stock originally used for the brutal sport of dog fighting the American Staffordshire Terrier is a companion breed that has always been loyal and trustworthy with family members. The history of the American Staffordshire Terrier coincides with that of the American Pit Bull Terrier until the 1930s. In truth, at the time they were one and the same dog, although they have diverged slightly since to become separate breeds. Breeders of the Pit Bull that wanted to show and not fight their dogs were trying to gain American Kennel Club (AKC) recognition for their breed, however the club had no desire to appear to condone dog fighting. The solution was for the breed to adopt a new name and the Staffordshire Terrier was accepted into the AKC in 1936, the “American” would not be added to their name until 1972.